The residential real estate market in Bangalore is gradually moving towards the price correction mode. After a consistent drop in the growth of average quarterly capital prices during the first three quarters of the year, the city finally recorded a negative price movement in Oct-Dec 2015. Despite thriving on housing demand generated by the IT/ITeS industry, property prices in Bangalore recorded no change and remained stagnant in the last one year. The first half of 2015 generated some hopes and the residential property market recorded a growth of over two per cent in average capital prices. However, the second half witnessed capital rates dropping by a per cent, indicating a market headed for price correction. While the market continued to be plagued with inflated property prices and oversupply of housing units in the luxury and high-income housing segments, there were some mood lifters like increased Private Equity (PE) and Foreign Direct Investments (FDI). Though the city’s residents aggrieved over the poor state of existing civic infrastructure, the government’s focus on future development at the city level continued to play a balancing factor for Bangalore’s realty market. Major projects like the Chennai-Bengaluru Industrial Corridor, Namma Metro and the development of road infrastructure in the city promised brighter days ahead. A portion of the Reach II under Phase I of Namma Metro, which covers a stretch of 6.8 km between Magadi Road and Mysore Road, was inaugurated in November 2015. The remaining stretch up to Majestic is expected to get operational by June 2016. Construction of the long delayed Phase II of Namma Metro commenced at two places after years of contemplation. This cheered the realty industry with impedning hopes for the residential zones along the metro corridor. In December 2015, the Karnataka Government approved a budget of Rs 1,200 crore for the development of roads throughout the city. The work on this project is expected to start in January 2016. Inundated by an oversupply of housing units, both East and South Bangalore saw capital rates dipping marginally in the current quarter. Affordability drew home buyers to the fringes of East and South Bangalore. This was evident as Gollahalli and Hoskote in the East and Attibele and Chandapura in the South recorded upward price movement to the tune of three to eight per cent in Oct-Dec 2015. HSR Layout, Singasandra and Kudlu Gate in South witnessed slight growth in values (one to three per cent) in the last quarter of 2015. This may be attributed to the change in the trash-dump policy, wherein, instead of 500 tonnes daily, only 60 tonnes is now dumped in these areas. Localities along the Outer Ring Road (East) continued to record declining sales volume and dipping capital values. After a 10 per cent drop in Jul-Sep 2015, prices toppled again by around five per cent in the current quarter. Varthur Road, Panathur and Ramamurthy Nagar were the worst impacted by the diminishing housing demand. Poor state of infrastructure and fast developing dumping yards at various patches are the major reasons behind the weakening housing demand near ORR. There were mass demonstrations by the residents demanding pothole-free roads, sidewalks and skywalks for pedestrians. Sarjapur Road, which also recorded a quarter-on-quarter dip in property rates, is also suffering on account of crumbling civic infrastructure. Capital values in Whitefield and Electronic City recorded marginal depreciation due to growing unsold inventory. East and South Bangalore recorded a mere one per cent growth in the average rental values between Oct-Dec 2014 and 2015. A spike in hiring activity in the last one year, the subsequent influx of migrants in the city along with the fast-paced growth of start-ups impacted the rental market in the city positively. Home owners refused to lower the ‘ask’ rates in the rental space despite crummy infrastructure and oversupply of housing units along the entire eastern and southern belt. 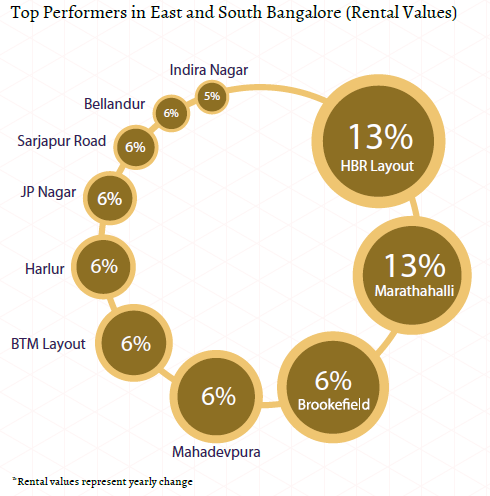 HBR Layout and Marathahalli emerged as the top grossers in the said period and recorded an annual growth of 13 per cent each in the rental rates. Well-built social infrastructure attracted the tenant community to these localities. Brookefield and Mahadevpura in East Bangalore recorded an annual rental appreciation of six per cent each in the last one year, despite civic woes. While a 2BHK in Brookefield commands a rent of around Rs 17,000 per month, the same in Mahadevpura can be rented out for Rs 15,000 per month. Proximity to Namma Metro drove the rental markets of localities such as Indira Nagar and CV Raman Nagar, where average rental rates appreciated by five per cent each in the last one year. Old Madras Road, Kanakapura Road, Begur Road and Electronic City saw the rental values declining by seven to eight per cent in the last one year. Plagued by ineffective implementation of infrastructural projects, capital values in North, West and Central Bangalore fell marginally by a per cent in Oct-Dec 2015, as against the previous quarter. Revelations of illegal properties and dubious water connections in prominent localities of North, West and Central Bangalore dampened investor sentiments, resulting in falling sales volume. After witnessing a slight price correction in the previous quarters, residential real estate market on Mysore Road raced ahead in the last quarter of 2015. This could be attributed to the government’s proposal to convert the road into a six-lane national highway. The area already enjoys connectivity by the Namma Metro and is also touted to grow into a large-scale industrial hub. While RT Nagar, RMV Extension and Rajaji Nagar were the most coveted localities in their respective zones, there were no new projects coming up due to paucity of land parcels. This resulted in the prices of existing properties to surge by five to seven per cent in the current quarter. Thanisandra in North Bangalore recorded limited sales in the current quarter, however, it boasted of a healthy investment potential backed by the development of Tech Park in Bharatiya City. Capital rates here grew by three per cent in Oct-Dec 2015, as against Jul-Sep 2015. Oversupply of residential inventory in Vidyaranyapura and Hebbal led to a slight price correction and average capital rates here dipped by two to three per cent each. Developers in Vidyaranyapura slashed property rates due to stiff competition and limited demand. Thriving on the growing number of start-ups and IT/ITeS companies, North, West and Central Bangalore witnessed a bustling rental market. Although between Oct-Dec 2014 and 2015, the overall growth in rental values was limited to one per cent, more than 80 per cent localities either recorded a positive price movement or maintained the same rental rates. 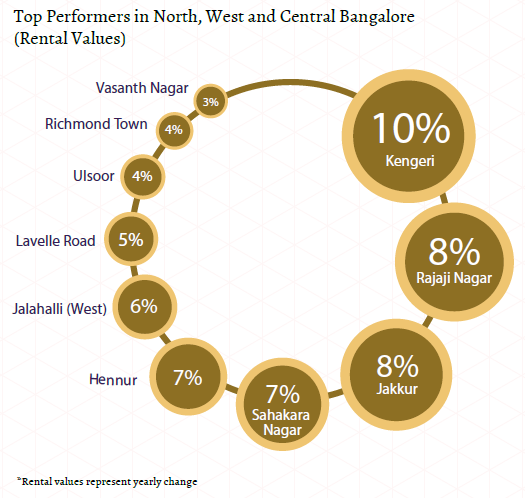 Kengeri out-performed all other localities with a 10 per cent surge in rental values in the last one year. Affordability and connectivity continued driving rental demand to this peripheral area. Towards the North, affordability drove tenants to localities situated along the Bellary Road, especially Jakkur and Sahakara Nagar. Rental values in these areas propelled by seven to eight per cent between Oct-Dec 2014 and 2015. Delivery of several premium projects in Hennur gave a thrust to the average rental rates by around seven per cent in the said period. Rental values on Lavelle Road grew on the back of successful attempts made by Bruhat Bengaluru Mahanagara Palike (BBMP) to clear the blackspots in the neighbouring areas. Garbage dump yards have been a major spoiler for the rental market of several localities in the city. Malleshwaram too got rid of about 13 such blackspots. Though the locality did not record a positive price movement, it remained undeterred by the oversupply of housing units. Oversupply of housing units engulfed the residential landscape of Bangalore. Buyers and developers shifted focus towards affordable properties. While this segment was the most absorbed in the city, lack of infrastructure in the fringes afflicted sales. Bangalore home buyers continued to prefer residential apartments over other property types – independent houses/villas and builder floors. Comparative affordability, value for money and availability of amenities kept demand and supply of residential apartments robust. The ongoing power shortage in Bangalore also added to the overall penchant for residential apartments. City authorities maintain that the ordeal will continue until 2016. Considering this, demand for residential apartments is anticipated to surge further because of the presence of power back-up facility. East Bangalore continued to suffer on the account of oversupply of residential apartments and the situation worsened in the second half of 2015. 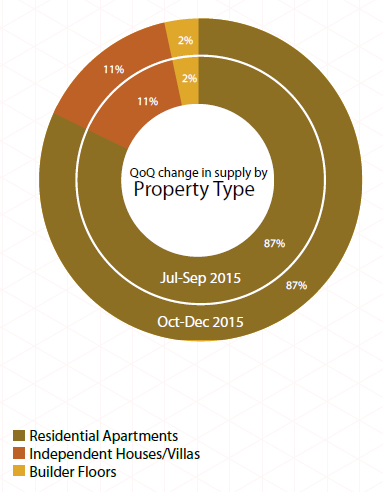 Supply of residential apartments in the East rose by two per cent and stood at 39 per cent in Oct-Dec 2015. South Bangalore continued to record the second highest share of apartments in the city. There was a notable hike in the supply of builder floors in East Bangalore. This primarily reflects the re-sale or secondary market, infer experts. 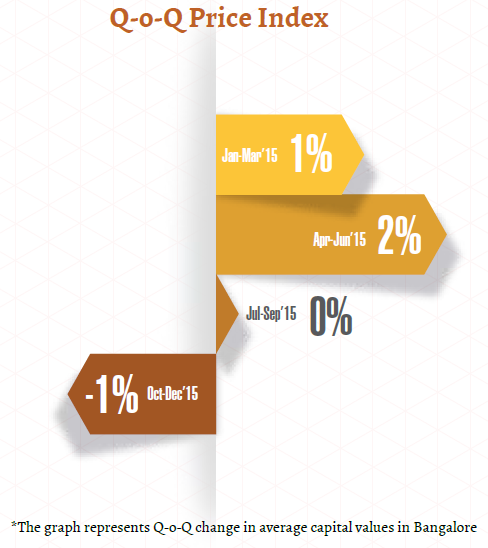 Several investors attempted to exit their investments in Oct-Dec 2015. Distribution of residential inventory on the basis of varied budget categories in Bangalore remained unchanged over the last two quarters. However, industry stalwarts aver that there is a growing focus on affordable housing (within Rs 40 lakh). Due to its huge demand, inventory in this category enjoys the best absorption rates and developers are increasingly cashing-in on this demand. 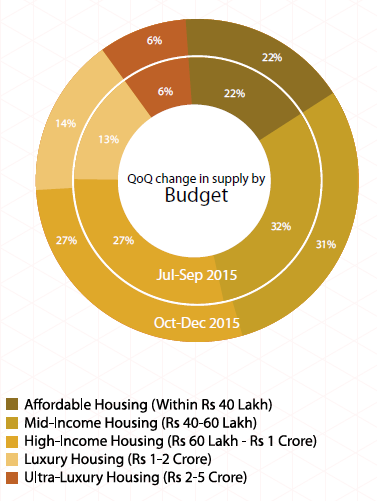 Similar to the previous quarter, the affordable housing segment garnered around a quarter of the total market share. East and South Bangalore took the lead and captured almost three-fourth of the total supply of affordable homes in Bangalore. North Bangalore recorded a significant rise in the supply of properties priced within Rs 40 lakh. Popular localities such as Hennur, Yelahanka, Hormavu and Thanisandra had maximum homes on sale under this price range. East and South Bangalore topped the share of mid-income housing inventory priced within Rs 40-60 lakh. There was a marginal rise in the supply of luxury-housing (Rs 1-2 crore) in the current quarter. Property in this budget segment garnered traction primarily from Non-Resident Indians (NRIs) and High- Networth Individuals (HNIs). Availability of luxury housing spiked up specifically in South Bangalore. Localities such as Kanakapura Road, Bannerghatta Road and Electronic City recorded maximum supply of the same. Supply of ultra-luxury housing (Rs 2-5 crore) shifted from Central Bangalore to the South. With the top-management of IT companies buying majority of these homes, preference moved towards developed localities in South Bangalore. JP Nagar and Jayanagar, which are also approachable via the metro, recorded maximum supply of homes priced between Rs 2-5 crore. More than half of the properties in the ultra-luxury budget segment in South Bangalore were available as builder floor units. 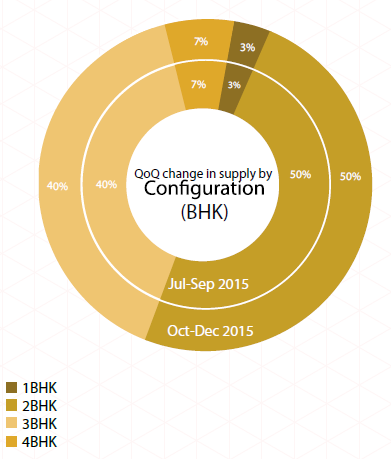 Supply of various configurations – 1BHK, 2BHK, 3BHK and 4BHK – has remained unchanged in Bangalore since Apr-Jun 2015. Being an end-user driven market, the city continued to garner maximum interest and thus, supply of 2BHK units. 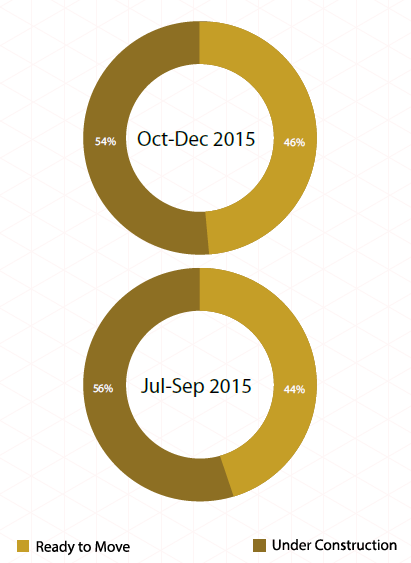 The category captured half of the total market share in Oct-Dec 2015. Majority of the 2BHK units (40 per cent) fell in the mid-income segment (Rs 40-60 lakh), followed by the affordable segment (within Rs 40 lakh). North Bangalore recorded an increased availability of 2BHK units this quarter. Experts attribute this to the increase in housing demand from the workforce of start-ups operating in the area. With an average size of 1500-1800 sq ft, 3BHK units made up 40 per cent of the total market share. Majority of the 3BHK units were residential apartments. Out of the total properties in Central Bangalore, almost half were configured as 3BHK units, most of which were priced beyond Rs 2 crore (ultra-luxury housing), followed by Rs 1-2 crore (luxury housing). While 4BHK units captured one-tenth of the total market share, they were mostly concentrated in East Bangalore. Though more than half of the inventory in the city was under-construction, the market reflected the developers’ mood of completing ongoing projects first. While the availability of under-construction projects dropped by two per cent and stood at 54 per cent in the current quarter as against Jul-Sep 2015, supply of ready-to-move-in inventory swelled up by the same percentage and stood at 46 per cent. Buyers continued to prefer ready projects in order to avoid inordinate delays, a common pitfall associated with under-construction projects. Out of the total ready-to-move-in properties, majority fell in the mid-income (Rs 40-60 lakh) and high-income (Rs 60 lakh – Rs 1 crore) brackets, which are also the most absorbed categories.